Provides an overview to the exam's topics, including a "Need to Know" list that identifies areas that must be understood in-depth. Includes exercises that can be performed, usually with a small test BW server. Contains practice test questions that assess the readers knowledge of the current exam topics. Serves as a complement to the classroom training provided by SAP. CATHERINE M. ROZE is a consultant with IBM's Global Services, Business Intelligence practice. She has over six years of full life cycle experience in business intelligence/data warehousing and specializes in solutions based on ERP, with a special focus on SAP-centric organizations. Roze has her MBA and MS (industrial technology) as well as her certification in SAP BW. She has written or cowritten numerous articles which have appeared in such publications as the Journal of Neurocomputing, Journal of Intelligent Manufacturing Systems, and the International Journal of Systems Science. Chapter 1- Enterprise Resource Planning, Business Intelligence, Data Warehouses, and SAP BW. Chapter 4- SAP BW Data Modeling. Chapter 7- SAP BW Extraction. Chapter 8- Getting Ready for Certification Tips and Tricks. Chapter 9- Simulated Certification Test. SAP BW and Data Warehouse Resources. Appendix B- SAP BW Quick Reference Guide. Appendix C- SAP R/3 Related Quick Reference guide. Appendix D- SAP BW 3.0 New Features. 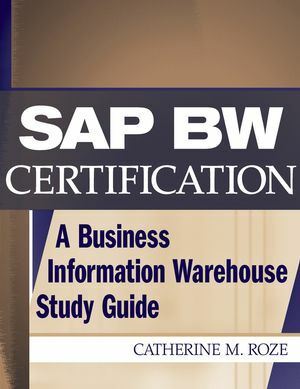 Appendix E- SAP BW Training Offerings: Course Description. Appendix F- Rolls and Skills for BW Project. Appendix G- SAP BW White Papers. Appendix H- SAP BW Standard Business Content.